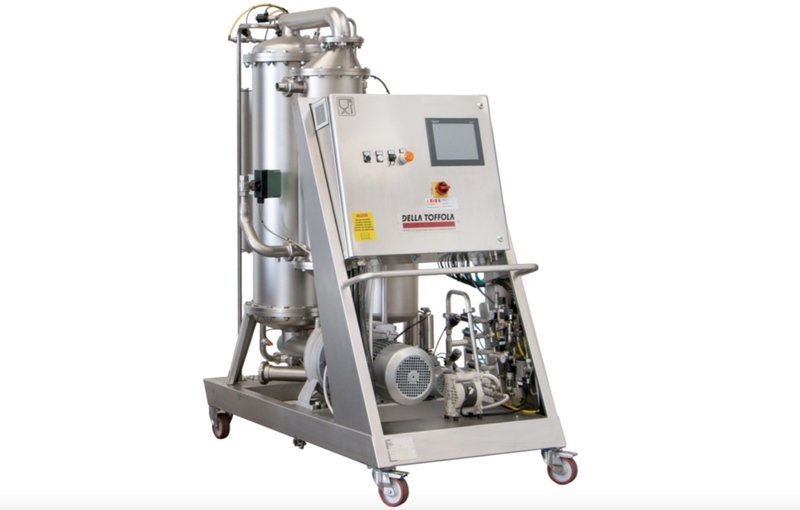 Filtering is done automatically and continuously, simply by connecting the filter to the tank containing the product to filter and to a tank for collecting the filtrate. The flow of the fluid being filtered is tangential to the surface of the membrane and the solids are separated from the liquid due to the pressure difference. The high-velocity parallel flow of the liquid in relation to the module ensures a continuous cleaning the membrane, thus allowing for very lengthy filtering cycles without the need to use chemical additives. To further prolong the filtering cycle, an incorporated backwash system periodically removes the thin fouling layer that deposits on the membrane. A low permeate flow rate or an excessively high concentration of solids in the retentate signify the end of the filtering cycle, when it is time to proceed with a thorough washing and chemical sanitizing process (which can be done at high temperatures with this type of membrane) using NaOH and citric acid as a neutralizer. Membranes pore size is 0,45 my but can be supplied with larger pore size. The duration of the filtering cycle and the capacity varies according to the features of the product being filtered and its temperature. The average capacity is 20 l/h/m2. Centrifugal product feed and pressurizing pump. Stainless steel pre-filter (which can be inspected) with a 1 mm2 mesh to retain any gross impurities that might obstruct the channels of the membranes, with sight glass. Main recirculation circuit consisting of stainless steel piping of suitable cross-section connecting the recirculation pump to the containers of the membranes. Multiple-channel ceramic membranes comprising a porous supporting material coated with titanium oxide of the required porosity, fixed by means of easily-removable gaskets onto one or two containers depending on the filtering surface area being used. The particular shape of the containers enables large surfaces areas to be obtained while reducing the overall dimensions to a minimum. High-efficiency centrifugal recirculation pump for ensuring the crossflow of the product inside the channels of the membranes. Backflow system consisting of an elastomeric membrane inserted in a special stainless steel housing and moved at programmable intervals by a pneumatic system. Service tank of adequate capacity, used for washing and as a plenum for the product, complete with washing system, inspection hatch, level detector and various couplings to the process. Piping for connecting the various machine components, complete with electro-pneumatic product cutoff valves, a sight glass on the product outlet, sample collectors, an electronic flowmeter, pressure sensors, a temperature sensor, solenoid valves for the delivery of inert gas, electro-pneumatic valves for draining the circuit, and safety valves. Means for delivering washing water with electropneumatic on/off valves for the cold and hot water and the product circuit, and for the drainage/signaling on any leaks from the water/detergent valves. An electric switchboard in a stainless steel cabinet with a degree of protection to IP 55, containing the electric power components for the control and protection of the various motors, the inverter for controlling the feed pump, the PLC- based section with digital-analogical inputs and outputs, the section for controlling and displaying the selectors, pushbuttons, pilot lights and operator touch screen for configuring and selecting the various working parameters. Pneumatic system for the compressed air and nitrogen, complete with manual on-off valves, filters, pressure regulators, pressure switches, means for controlling the flow to the valves, detectors of any presence of liquids in the backflow outlet and solenoid valves. Wheel-mounted frame made of stainless steel profiles, on which all the above-mentioned components are rationally arranged and suitably fixed to create an integrated structure that is easy to position and install. Historical records of the main processing data (date and time, selected and actual mean flow rate, selected and actual total volume filtered, filtering time, number of emptying procedures, number of rinsing procedures, initial and final ΔP, number of viscosity alarms, number of minimum flow rate alarms, selected and actual filtering difficulty, maximum viscosity, temperature, type of washing cycle, permeability test). These data are stored in the machine, but they can also be transferred by e-mail at the end of each filtering process. Two inlet valves, two outlet valves and two drainage valves to enable the filtering from one pair of tanks into another, or from one tank into two tanks. For more info on the best filtration solution for you, please contact our experienced team for an obligation-free quote.